My wife and I were very lucky to book a 4 hour trip with Captain Karen. To put it simply she makes your trip GREAT! She was so friendly and went out of her way to make our trip comfortable and what we wanted to do. We spent most of the time fishing and just relaxing. I was fishing and my wife was very busy relaxing. The fishing was fantastic. We caught many yellow tail, snapper and grouper. Captain Karen also is very informative about the area and is very interesting to talk to. I have never written a review on anything but felt strongly that this experience was very worthy of writing a review. We would very much recommend Venus Charters and Captain Karen. We had a fantastic trip on Venus Charters with Karen to see the dolphins and to snorkel. We had booked a 3 hour trip with Karen and it was worth every dollar. We were so fortunate that the day we went out on the water was perfectly calm and the horizon was just beautiful. You couldn’t tell where the sky ended and the ocean began!! We were able to see a group of at least 7 dolphins swimming and playing, and they came right up to our boat!!! After seeing the dolphins we went to 2 different reefs to snorkel and saw many fish and coral. It was a perfect day for my partner and me and when we come back to Key West Karen’s charter will be on our repeat list. Don’t let this opportunity pass you by–definitely a life’s top 10!!! Thanks Karen for such a wonderful experience. Captain Karen was amazing, we took the charter to cruise the area around key west, and do a snorkeling trip. First captain took us to a natural dolphin playground where we were able to see the Dolphins in their natural habitat. There must have been about 20 of them just frolicking in the water it was so much fun. Once we were done with that she took us to a snorkeling spot near a ship wreck, it was so much fun. I highly recommend captain Karen for all of your boating needs. We found Captain Karen and Venus Charters in an issue of the magazine Lesbian Connection while we were planning our honeymoon. She offered us great advice on where we should stay ahead of the trip and we planned 3 separate charters with her which included snorkeling/ dolphin watching, snorkeling/ fishing, and a sunset cruise. All 3 trips were a blast! 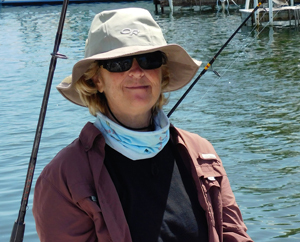 She is very knowledgeable about the best locations to do all 3 of the above mentioned trips as well as being knowledgeable about the best locations in Key West to stay, eat, and have a good time. I learned how to properly fillet a fish by watching her very skillfully do it with the fish we caught with her and she directed us to an excellent restaurant for preparation. She is personable and pleasant and was kind enough to move one of trips ahead of time due to weather concerns. We really enjoyed our time with her and we will book more trips with her when we return to Key West. Thanks for helping us have an excellent honeymoon!